A mouse is taking a stroll through the deep, dark wood when along comes a hungry fox, then an owl, and then a snake. Since the mouse "looks good" to all, he explains that he's meeting the Gruffalo! As Mouse explains, the Gruffalo is a creature with terrible claws, and terrible tusks in its terrible jaws, and knobbly knees and turned-out toes, and a poisonous wart at the end of its nose. But Mouse has no worry to show. After all, there's no such thing as a Gruffalo. Kidtoons is "dedicated to helping parents connect with their kids by bringing family friendly animated movies to the big screen." Find a Kidtoons location near you here. There have been lots of new theaters added. 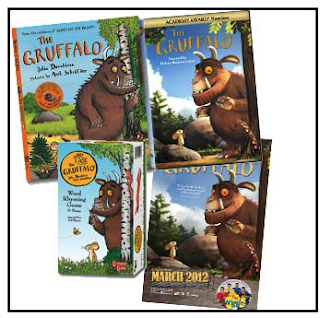 You can also find Gruffalo coloring pages and a Gruffalo mask! 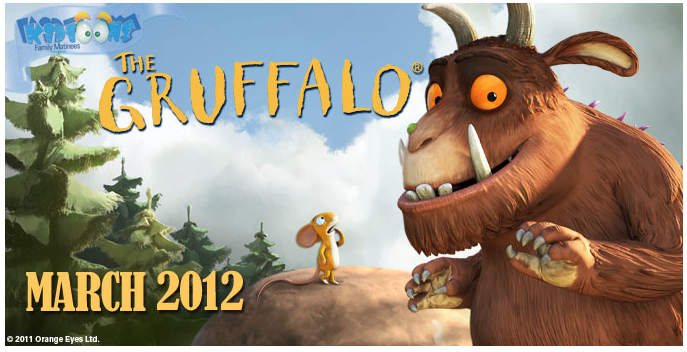 One winner will win a Gruffalo Prize Pack! Giveaway will end Wednesday, March 28th at midnight MST. Winner will be chosen by Random.org. No compensation was received. Prize pack sponsored by Kidtoons. Email addresses will be deleted after giveaway. Your privacy is important. US residents only. This looks really cute! Thanks for the giveaway! We love this book. We would love to see the movie! Thanks for the chance on this giveaway. We love this movie! If you haven't seen it yet, you should! I know my boys would love this- especially my youngest! stoked about this giveaway! my kids would go nuts! The Guffalo is very imaginative. Thanks for the great giveaway. kristiedonelson(at)gmail(dot)com Thank you. We have the Gruffalo book--very glad to see there are movies also! This looks very cute! I think my kids would love it! Sounds like a great movie, thanks for the giveaway! This book is too cute! Thanks for the giveaway! Sounds cute! Would love to win for my little boy! This would be a fantastic movie to share with my granddaughter. Thanks.